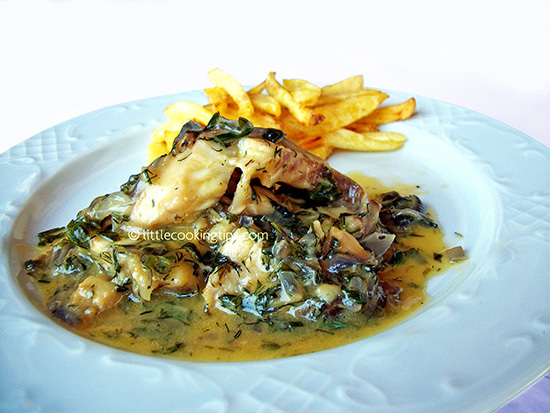 Maybe it is a bit unusual to combine fish fillet with the Greek traditional egg-lemon sauce. However, it is a recipe that was more common in the past. We tried it and we were surprised by the amazing result! It's different, it's very tasty and leaves a great aftertaste. It can be cooked with any white meat fish (flatfish-common sole, cod, swordfish).We used a cod fillet with great results. Let's start cooking it! Preparation: Wash the fillets and put them in a small pan or bowl. Add the juice from one of the lemons, salt, one of the garlic cloves and half a cup of the olive oil. Cover with cling film and leave it on the fridge for 1-2 hours. In a deep frying pan, pour the rest of the olive oil and put it on medium to high heat. Once the oil is hot, add the onions and saute until they are translucent. At this point add the fish fillets (without the juices from the bowl where they were marinated), the water, the parsley, the dill and the rest of the garlic. Add salt, pepper and stir carefully to avoid breaking the fillets into small bits. Beat the eggs in a bowl and slowly add the juice of the second lemon. Using a small ladle -or even a tablespoon- take some of the fish broth (it doesn't matter if you also scoop some oil/greens) and start adding it to the egg-lemon mix, while whisking continuously. Add the broth slowly, as the purpose is to increase the temperature of the egg-lemon mix close to the level of the fish's temperature. You will need almost all of the broth and oil from the fish to achieve that. The result has to be a hot yellowish sauce. Once the egg-lemon sauce is ready, pour it in the fish, hold the pan and swing it lightly in a circular manner for a 4-5 seconds. Do not stir! Serve with french fries. Kali oreksi! 1. Avoid using any fish with reddish meat, like tuna or salmon. This recipe is ideal for fish with white meat. 2. For a thicker and fluffier egg-lemon sauce, you can beat the egg-whites into foam, separately from the yolks. Then incorporate the foam into the beaten yolks and after that, start adding the lemon and the broth. Crispy fried fish : beer battered tasty cod fish bites!